← Guess Who Is Coming To Dinner? 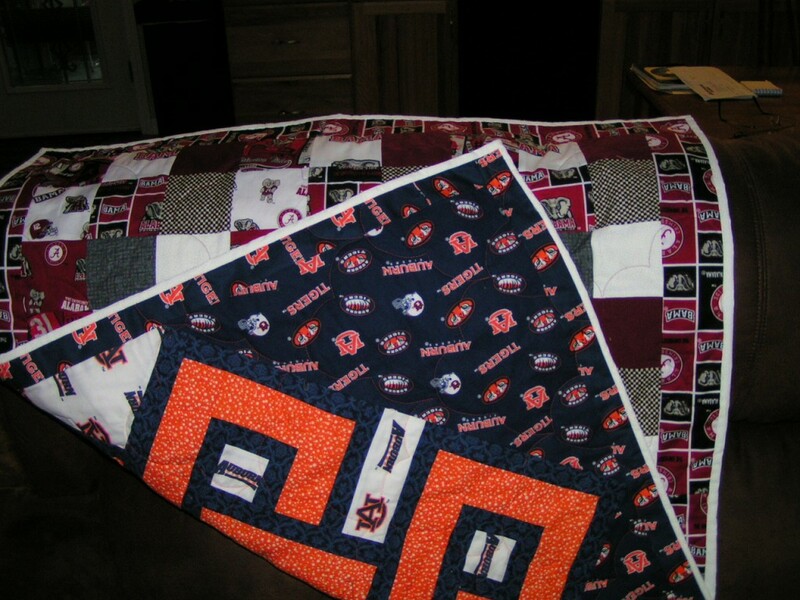 What do you do when Mama is for the University of Alabama and Daddy is for Auburn University? Well this happens sometimes, but Aunt Jan came through. 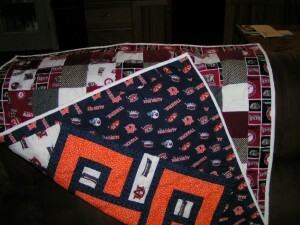 Gary and I made this quilt for her to give to our new addition to the family. This of course would be the Auburn side. It was made in the Gordian Knot pattern. This is the Alabama side. 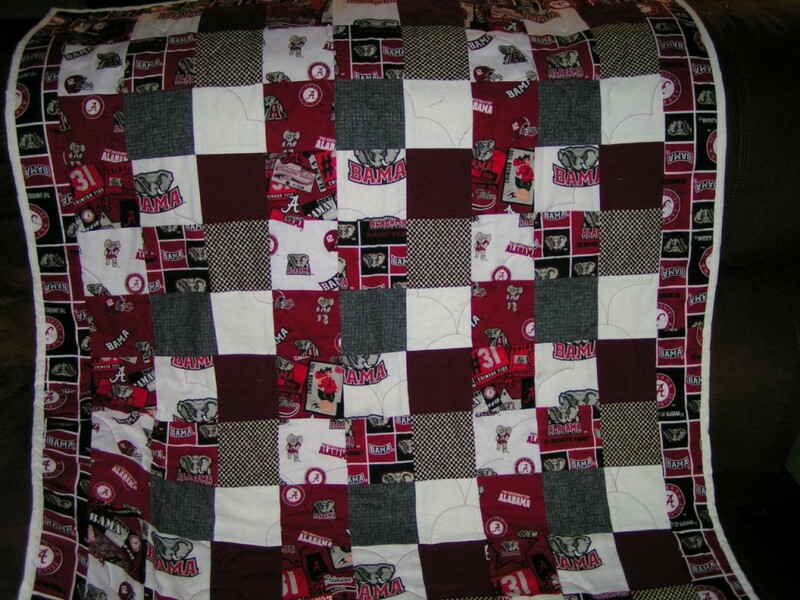 It was made with all the Alabama fabric we had cut into 4 inch squares. Gary and I are Auburn fans but I admit I liked this side very much. We are not sure what team the baby is for yet! Here is what it looks like with a little bit of both. 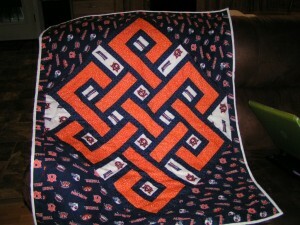 To all who have not tried the Gordian Knot pattern it is very easy and so fun to watch it come together. 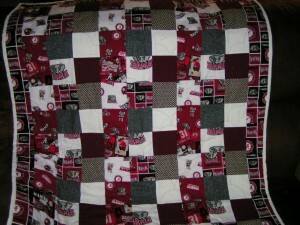 This entry was posted in Family Info, Family Stories, Quilt Pictures, Quilt Stories. Bookmark the permalink. 2 Responses to What Do You Do When???? I agree, the Gordian Knot is great fun. Such a shame to have lost Mary Whitehead, I would have loved to see what other great designs she could have dreamed up. 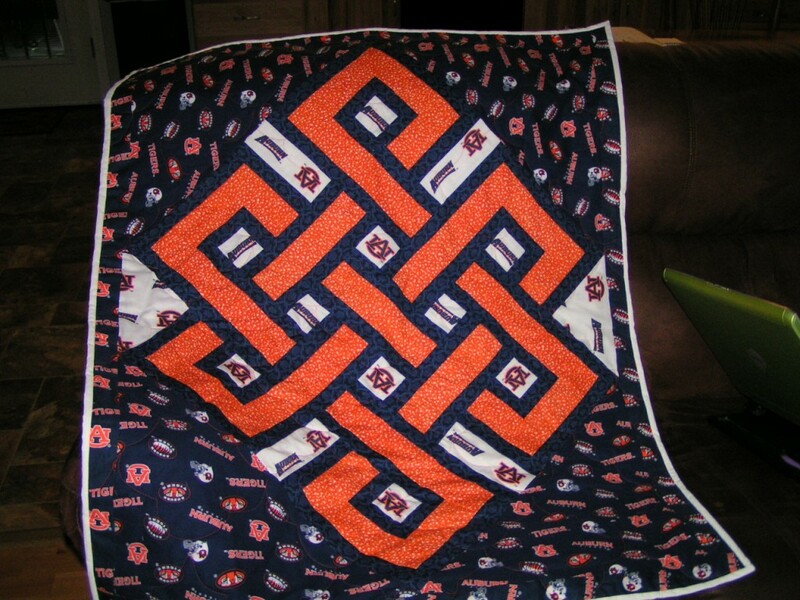 I taught the Gordian Knot class for many years and students always loved it…and were also always astonished that the last piece to be stitched was the center! Such fun! Glad to see you did make use of the class even if the whip had to be applied to keep you sewing. It looks great….